Here at BigFlare.com we’ve reviewed over 100 Google Shopping campaigns over the years. In that time, we’ve seen pretty much every money-wasting mistake that it’s possible to make in Shopping. Some of these are rare, one-time-only type errors. But some of these are surprisingly common. And, in fact, there are 3 mistakes in particular that we see being made in almost every account we review. With this in mind, there is both good and bad news for Shopping advertisers. The bad news is that these mistakes are common and probably costing you money. The good news is, these mistakes are quick to fix. A few clicks here, some minor adjustments there and presto! You should have a more profitable Shopping campaign in less than half a day’s work. So, let’s dig into each of the mistakes and the solutions for them. What we’re seeing here is one of the main ad groups within this client’s Shopping campaign, before we came along and optimised it. Within the ad group we have the product group. Bids are controlled at the product group level and you can split out your feed however you want. You could have all products in your feed in one product group, or you could have one product group per category, one product group per item, etc. The mistake we often see, the one you’re seeing in the above image, is having the product groups split out into any level higher than the single product / item ID / SKU level. In the above example we see that all products are in one big product group for the whole account. Another common error we see is having one product group per category. Whenever you are lumping lots of different products into the same product group you reduce your ability to bid optimally per product. CPC bids are controlled at the product group level. 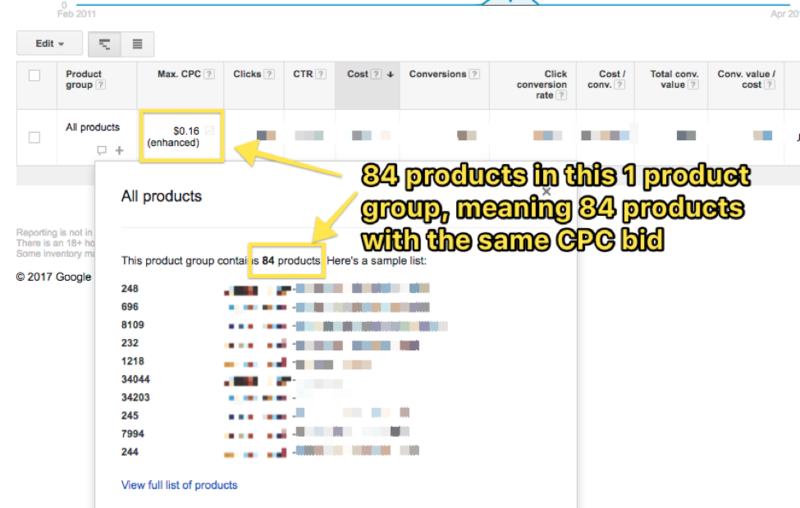 This means that if you have 1 product group with 84 products in it, you only have 1 CPC bid for those 84 products. Your products will all tend to have different prices, conversion rates, click-through rates, and margins. Each one will thus have its own unique ideal CPC bid, and this ideal bid will change over time as the competitive landscape shifts and search volumes naturally fluctuate. So, don’t limit yourself to only 1 CPC bid to cover multiple products. Split out your product groups as finely as possible: right down to the individual item level. This way, you can give each product the individually customised CPC bid that it needs and deserves. This would give you a very simple structure of having 1 ad group with all your products in it, and each product having its own product group. There are many other ways of structuring your ad groups and this is just one of them, the simplest one. What we’ll show next is the next level of ad group / product organisation, the SPAG. SPAG stands for Single Product Ad Groups. This is taking the one-product-per-ad-group structure even further and splitting it out so we have one product in each ad group. If you have more than a few products in your feed, this is going to take a while to do, so I’d recommend using a tool such as PPCsamurai.com or Optmyzr.com to help you do this quickly. The main benefit of splitting out your Shopping campaign into SPAGs is a highly increased ability to “funnel” search terms using negative keywords. Let’s say, for example, you have two products, product A and product B, that would match the query “blue trainers”. Product A is low margin and less profitable, product B is a bestseller with high margins and conversion rates. Of course, if someone searches “blue trainers” you would prefer them to see Product B’s ad, not product A. Without a SPAG structure you could try to do this by setting bids appropriately, but it’s never going to be foolproof. With a SPAG structure you can now create a negative keyword in A’s ad group for “blue trainers” and all the traffic for that keyword will now correctly be funneled to product B. If you don’t split out into SPAGs, you lose the ability to do this, as negative keywords are controlled at the ad group level, not the product group. You’re already splitting out your brand traffic from your non-brand traffic in your Search campaigns, right? Please tell me you are! Brand traffic is an entirely different beast to non-brand traffic. It consists of people who already know your brand and want to come directly to your site and (hopefully) buy something. Non-brand traffic will contain a much higher proportion of new vs returning visitors, and thus it needs to be treated differently to Brand, different targets, different bids, etc. So that’s why every search marketer worth their salt is already splitting out brand vs non-brand traffic in Search. Why isn’t everyone also doing it in Shopping? I think the answer is that, because Shopping does not have keyword targeting, most Shopping advertisers do not even realise that splitting out brand vs non-brand traffic is even an option. But it is! This is going to be an exact duplicate of your normal “Generics” or “Non-Brand” campaign. Set this campaign to medium priority level in the campaign settings. Go into your non-brand campaign and add in your brand terms and all associated keywords (plurals, misspellings, etc) into the negative keyword list for the whole campaign. And there you have it! You now have a fully functioning brand / non-brand split in your Shopping campaigns. When someone searches for a brand term that triggers Shopping ads, they will not see the non-brand ads because those terms have been negative matched from your non-brand campaign. When someone searches for a non-brand term that triggers Shopping ads, the higher priority on the non-brand campaign will kick in and ensure they see the non-brand ad not the brand one. Now you’ll be able to set specific bids for brand Shopping and split it out accurately on your reporting, just like in standard Search campaigns. How often are you currently updating the CPC bids on your Shopping ads? If you are like most advertisers whose accounts we review, the answer is, “Oooh maybe once a month, at most, but often a lot less than that.” This attitude towards bid optimisation, and a poor strategy behind bid optimisation, is probably the main reason why we see client Shopping campaigns underperforming versus their targets. The Search advertising marketplace for your products is shifting, dynamically, ALL THE TIME. Competitor’s are adjusting their prices and releasing new products or updates. Search volumes are going up and down. Conversion rates are twitching according to time of day, day or week, and season. Uncountable other factors are influencing consumers to buy more of or less of your products. This is happening in real-time, potentially thousands of times per day. With this in mind, you can’t really expect to have ideal CPC bids in Shopping if you only update them once per month, right? There’s a challenge here, of course. We’d all like to have CPC bids updated in real-time to maximise our profit or ROI goals. But, what if you have thousands of products listed? How are you going to optimise so many bids with the frequency of updates required for optimal profitability? The answer is, trust in the machine. Automated bid management by Google and by third-parties has gotten really good over the past few years. We are at a point now where, assuming you have enough conversions (about 30-50 conversions per performance group or portfolio will normally do it), an automated bid management system can do a very good job of dynamically updating bids and hitting your performance targets. The only remaining challenge now is setting the right Adwords goals (ROAS, CPA, Clicks, etc) to match your overall business goals (profit, revenue, growth, etc). At Big Flare we’re a big fan of Adspert’s bid management tool. Despite not having access to as much data as Google’s free built-in bid optimisation tool, Adspert has often outperformed Google in many of our tests. However, as with any third-party tool worth using, Adspert is not free. Google also has it’s built in bid management algorithms that you can use for free and that do a pretty good job as well. Whatever the tool or algorithm you use, we recommend you get on one right away. Shift your bid management system from checking once in awhile and updating manually, to setting up automated bid management and then checking on the results once per week to make sure your Adwords bidding goals and results are delivering the business goals you are trying to achieve. To set up an automated bid strategy with Google, simply head over to: Shared library > Bid Strategies and create a new strategy. For Shopping campaigns, and for eCommerce PPC in general, Return On Ad Spend (ROAS) based bid strategies are recommended. Out of the bid strategies available on Adwords, only ROAS can bid based on the actual return you are receiving, rather than just on the number of conversions or clicks. Name your bid strategy something meaningful. If this is going to be a Shopping only bid strategy, then name it with “Shopping” at the start then add your performance goal too. Select which campaigns you want to include. This can also be done via campaign settings. Set your performance target (in the example above, a ROAS target of 300% was set) and then click save. There is the advanced option available to set a minimum or maximum bid, but for most advertisers this is not recommended. Simply let Google bid whatever it needs in order to achieve the target you set. As long as your performance target is being met, who cares what maximum or minimum CPC bid is being used? Click save and you are good to go. AdWords bid strategies take time to learn and adapt. Do not just switch it off in a panic after two days if it hasn’t met your goals yet! Depending on how many conversions you have, the bid strategy could take anywhere from 1-4 weeks to reach optimal performance. When you start out, be patient and wait for it to dial in your bids. If you drill down into the bid strategy, you’ll be able to check the progress of its learning curve. And there you have it. The three most common AdWords Shopping campaign problems we see in client accounts, and the exact solutions for them. There are, of course, plenty of other common problems that we see coming up in more than a few Shopping campaigns, so this is not the be all and end all of Shopping campaign improvement. But, if you are currently running Shopping ads in-house, it’s likely that the three above items are three things you could be doing better with only a minimal investment of your time and effort. Are you making any of these mistakes and did this article help? Are there other challenges you are having with Shopping? Feel free to share in the comments below!